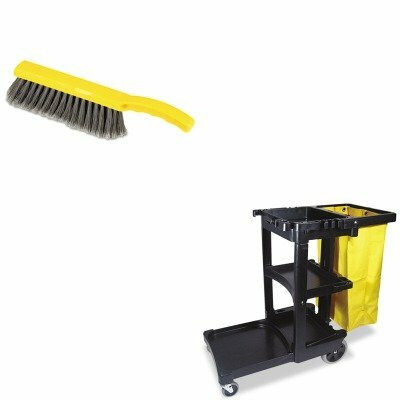 KITRCP617388BKRCP6342 - Value Kit - Rubbermaid Countertop Brush (RCP6342) and Rubbermaid Cleaning Cart with Zippered Yellow Vinyl Bag, Black (RCP617388BK) by Rubbermaid at Blog Free Here. MPN: RCP617388BKRCP6342. Hurry! Limited time offer. Offer valid only while supplies last. lt;stronggt;RCP6342lt;/stronggt;lt;BR/gt;Rubbermaid Countertop Brushlt;BR/gt;Brush is designed specifically for quick countertop cleanups. lt;stronggt;RCP6342lt;/stronggt;lt;BR/gt;Rubbermaid Countertop Brushlt;BR/gt;Brush is designed specifically for quick countertop cleanups. Commercial-grade fill ensures effective dust and debris removal. Wide bristle coverage simplifies tasks. Durable plastic block handle features built-in finger notches. Bristle Material: Polypropylene Brush Length: 12 1/2amp;quot;.lt;BR/gt;lt;BR/gt;lt;stronggt;RCP617388BKlt;/stronggt;lt;BR/gt;Rubbermaid Countertop Brushlt;BR/gt;25-gallon vinyl bag attaches to handle. Three shelves for supplies hooks for mops and brooms. Platform holds standard size bucket supplies not incl.. Color: Black Caster/Glide/Wheel: Four Casters.